Baggage Capacity 195 cu. ft.
As a leading corporate jet charter, the Bombardier Global 6000 is a heavy jet that seats up to 19 passengers depending on its configuration. It has a range of 6055 nautical miles and a maximum cruise speed of 511 knots or .89 Mach. The Global 6000 is a superior business jet charter with a service ceiling of 42,400 feet. 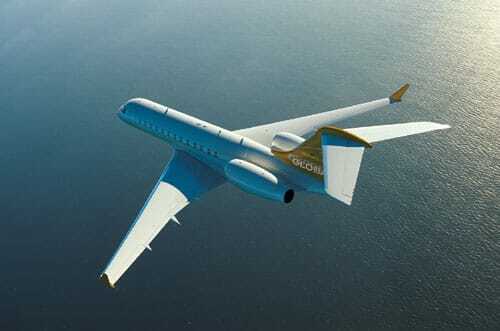 This is the former Global XRS model, the Global 6000 is an ultra-long-range executive jet. This beautiful private jet charter has a baggage capacity of 195 cubic feet, for the convenience of each client. This business jet charter boats a cabin width of 8.17 feet, a cabin height of 6.25 feet and a cabin length of 48.35 feet. The Global 6000 features a lavatory with an enclosed shower, so each client can be prepared for wherever their business jet charter is heading. Whether you are conducting a business meeting or trying to relax after an important corporate trip, the Global 6000 is a premier private jet charter. With advanced wing design and an expansive cabin for maximum comfort, the Global 6000 is one of the most popular and convenient private jet charters.